There is a time for everything. For you and for me…and for all Malaysian….the time has come to prepare ourselves for the worst. What, you may ask, can now happen to you that is worse that the situation you are already now in? You already do not earn enough to keep your family to the life you have lived before this Idiot came to power. You no longer have any savings you can use to sustain you from one salary to the next…you have to beg and borrow to meet your monthly expenses…what more to put food on the table and pay for the roof over your head. No prospect of any increase in income, no raise…no bonus (unless you are a civil servant)…no hope, nothing to look forward to but more misery and suffering, not only for yourself, but also for the children you are now trying to put through school, college or University. Life is bleak…hope is no longer something you dare to even think about…for how can anyone have hope for the future when the present holds nothing but the reality of more misery and more suffering. Before I answer that, you need to ask yourself how those who have been fighting our fight for us are now doing? And what is our fight? The fight against a corrupt and arrogant gomen that is now wrecking our lives and the future of our children and grandchildren asunder? How is Tun Dr Mahathir doing? Go ask any 92 year man how he feels in the morning! What does he want to do? 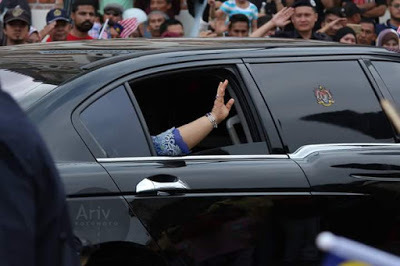 Tun is now in Langkawi….not for a holiday…he has work to do there. Work having to do with PRU 14. He will be having breakfast on the run and he will not stop until he is too tired to do anything else but sleep and that is still many many hours away! Kit Siang? The same as what Tun Mahathir is doing…working tirelessly and without any thought to his physical self and comfort. Kit Siang is focused on what needs to be done at PRU 14. Anwar Ibrahim? Brother Anwar has been up since dawn. He has said his Subuh prayers and then his Doa for all that is good for his family, us, Malaysia and the future. And you can be assured that whatever he can do within the confines of Sungai Buloh for Pakatan Harapan, he will do. So now I ask…what will you do? Go earn a living to feed your family. Go do what it is you do to keep life and limb together…and then what? I urge you to think and see what it is that you can do to help Pakatan Harapan find its way to Putrajaya. Even if it is to lift that little index finger of your towards that Idiot, Umno and BN to tell them what you think of them. Those of you who can do more….do more. Be an activists, attend ceramah organise by Pakatan Harapan…put nails in the road when you know that the Flying Hippo is going to pass your way. …..and post these images of that Idiot on your FB, blogs …or simply copy and distribute so that everyone can see what a desperate dog fighting for his survival in a fight he has already lost…looks like. 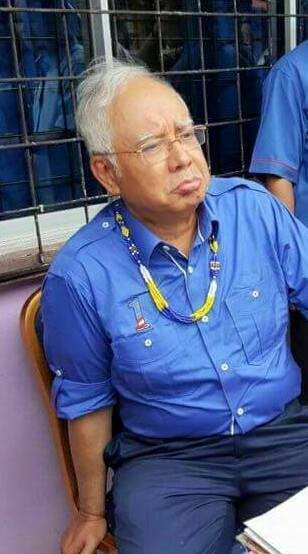 We can do plenty to put the fear of God into this Idiot, into his wife, into Umno and BN. We need to make them understand beyond a shadow of a doubt that we want them out of government, out of our life and into Sungai Buloh. And more important we must now demonstrate to them that we will not stand for any attempt by any of them, to hinder the holding of anything else but a clean, fair and open PRU 14. And may I ask that each and every one of you go find a stone small enough to fit in the palm of your hand but yet big enough to make as much damage as possible when it is needed….hide that stone in the palm of your hand and be ready to use it should this despicable Idiot and his henchman think that they will try to take back an election that they have already lost through whatever means at their disposal. If this Idiot sends PDRM after you…stone PDRM. If he sends RELA after you. Stone RELA. You do not have to worry about the ATM – ANGKATAN TENTERA MALAYSIA – …you do not have to worry about the Army coming after you for I have it on good authority that the army are just as fed up with the antics of this Idiot and his wife. So the Army can be counted upon to do what is right……and what is right is for the Army to do is to stand on the side of good and righteous….and that is you and me. So help me God. By Hussein Abdul Hamid|2018-07-14T05:44:03+08:00January 18th, 2018|Categories: Uncategorized|Tags: Najib, Rosmah|Comments Off on There is a time for everything. For you and for me…and for all Malaysian….the time has come to prepare ourselves for the worst. What, you may ask, can now happen to you that is worse that the situation you are already now in?